Posted on November 9, 2005 by Chad O. Information is starting to trickle out concerning Asus’ next ultraportable laptop, the Asus U5. 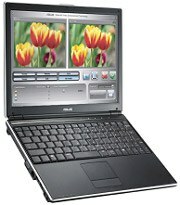 It’s an Intel Pentium M-powered ultraportable with a 12.1-inch widescreen display, weighing in at around 3lbs. This is Asus’ first laptop that is lead and halogen-free, and this has generated some buzz. We’ve put together a short page concerning the specifications we know at this time. No price or launch dates have been set. No word on if this replaces Asus’ W5A or Z33A. Engadget Article – Dicussing environmental-friendliness. This entry was posted in Announcements, ASUS. Bookmark the permalink.